Halloween is less than two weeks away now, which means it's finally time to carve your pumpkins! Pumpkins only tend to last about 14 days after being cut into, so if you've been waiting, you're now in the clear! MarthaStewart.com has a great gallery of creative pumpkin ideas you can see here. Below are a few of my favorites to pique your interests. One of the beauties of fall is its changing leaves. So why not put them on your pumpkins? Love this idea! 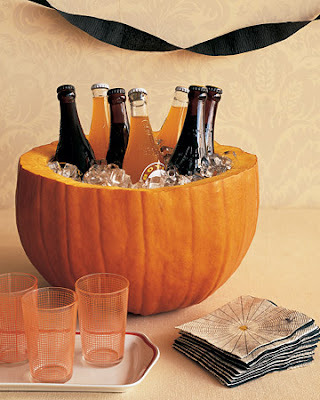 For a more festive look than an ice cooler, try out a pumpkin. I think it would be cute painted with the word "Boo" or "Drinks" on it as well. 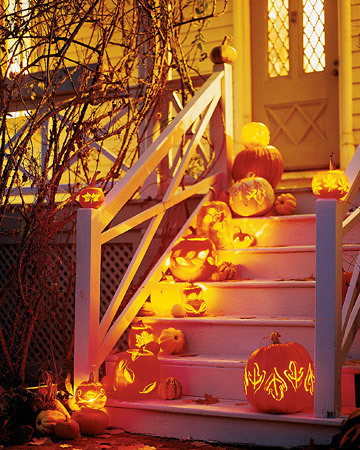 As far as lighting your pumpkins go, you don't have to worry with candles. Martha suggests wrapping a glass mason jar with a string of white lights. It's better if it's battery operated so you don't have to deal with any cords. But either way, they'll be safer (no chances of fires) and more effective (no lights being blown out by the wind).